Farmgirl life is relatively new for me, which means I have lots to learn and that the learning is often amusing, at least after you’ve cleaned off the horse snot, the dirt, and the sweat. For other new farmgirls (and guys), I thought I’d share some tips that are working around Wild Horse Valley. When it comes to getting medicine in a horse, a girl needs an ace in her pocket. Let me tell you that there is no amount of reasoning, cajoling, coaxing, or sweet talking that will convince a thousand-pound horse to take his meds. And while some folks may like to cowboy it, horses are large animals with strong powerful heads and necks, so that is just not an option for this farmgirl. Not to mention, it’s just not my style. Like medicine for children, horse meds come flavored, with the most popular being apple. Also like medicine for children, the flavor does not help the medicine go down. (Mommy friends, you know what I mean – cherry does not equal ice cream.) Trust me, no one wants to be covered in horse meds sneezed and snorted all over your favorite barn t-shirt. But as I recall from one of my childhood favorites, a spoonful of sugar does indeed make the medicine go down. 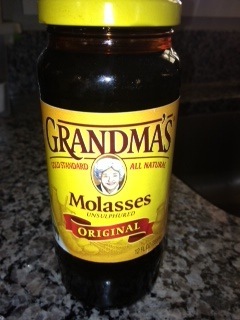 Enter molasses! I keep a a stash of molasses on hand in the barn for those times when it does a horse good. Also on hand in the barn is a jar of bute powder, think Children’s Tylenol for horses. Molasses – a farmgirl’s best friend when you need to get meds into your horse! We’ve got an older mare, Sweet Suzy Q, who occasionally needs some bute for an aching joint or minor inflamation. And although it is apple flavored like all good horse meds, there is no convincing her to take it, that is until you mix it with a spoonful of molasses and a serving of her feed. All of sudden the dreaded medicine becomes the best treat ever. Learning how to work with my horses for their good, my safety, and our combined happiness is how I get that cowgirl up feeling. For my next farmtastic tip … it is absolutely critical to label the horse thermometer. Enough said! Previous Post Everything’s Coming Up … Dishes? Next Post Who Said Horses Weren’t Expensive?